Eight DVD set released October, 2000 by Universal Studios. Includes Dracula, the Spanish version of Dracula, Frankenstein, The Mummy, The Invisible Man, The Bride of Frankenstein, The Wolf Man, The Phantom of the Opera, Creature From the Black Lagoon. Mono sound, full screen, unrated. Extras include critical commentaries, documentaries, theatrical trailers, etc. Manufacturers suggested retail price, $199.98. I also notice that these forthcoming DVDs apparently dont have the documentaries, critical commentaries and other extras put into the first eight in the series. The documentaries are finefar better than the puff pieces that pass for documentaries on most DVDsand the galleries of photos and ads are good material. But I cant say that Ill miss the commentaries. I thoroughly disliked the commentators recitations of scripts about actors careers, complicated references to earlier discarded versions of screenplays, dissertations on makeup and sets, and so forth. Id rather shut off the TV and read a book to get that kind of information. The four remaining Universal films in this set are products of more than two decades of Hollywood evolution. In the early to mid 1930s, when the most revered of classic horror films were made, Hollywood was still in a formative stage, experimenting with the capabilities of sound, trying out new kinds of stories on a new-found mass audience. This was the environment that produced the films that set the standards, including The Mummy (1933), a derivative but decidedly weird piece of film fiction. Horror was increasingly aimed at a younger audience as adults were busy with a little thing called World War II. The 1940s brought a few big-budget productions with big stars, lush settings and toned-down shocks, and on the other end of the spectrum, a host of cheaper horrors with lower-ranked actors, make-do production values and occasional innovative ideas. On the “A” side, for example, there was the stately Portrait of Dorian Gray and the Spencer Tracy remake of Dr. Jekyll and Mr. Hyde, respectable but unexciting films. Among the “Bs,” there were Cat People, I Walked With a Zombie, and Val Lewtons other thoughtful films, plus a slew of lesser pictures ranging from Paramounts elegant The Uninvited to horror-slapstick from Abbott and Costello and the Bowery Boys. Studios such as Monogram and PRC were established to fill the need for B-movie programmers, bottom-of-the-barrel stuff such as The Ape Man and The Mad Monster. Universal Studios had stayed afloat with the success of Deanna Durbins modest musicals beginning in the late 1930s, after the first wave of horror receded. With the success of re-released horror classics, Universal found itself in the fright business again, and took a varied approach to the genre: a few “A” pictures such as The Phantom of the Opera (1943) and the follow-up The Climax; and among the back-lot “Bs”, revivals of old favorite monsters in series, plus some original efforts such as The Mad Ghoul and The Wolf Man (1941), the latter being the only Universal film of this period to initiate a “classic” monster character. Still, horror was not Universals mainstay; the genre accounted for a small percentage of the studios production of about 60 films a year. The studio system began to collapse in the late 1940s, but Universal was quick to adapt to new conditions. It was the first major studio to offer an actor (James Stewart) a percentage of profits on a picture (Winchester ‘73), a rare practice then but common today when big stars are free agents. Universal became Universal-International and imported many British films, but also maintained its back lot, its acting school and a cadre of contract players and directors. The horror film, typically in a science fiction framework, was only an occasional venture for Universal in the early to mid-50s, as the studio concentrated on creating a steady stream of westerns, modestly budgeted musicals, and lowbrow humor series featuring Abbott and Costello, Francis the Talking Mule and Ma and Pa Kettle. As Douglas Sirk was the studios specialist in melodrama and Budd Boetticher its resident western director, Jack Arnold handled the SF and fantasy, beginning with It Came From Outer Space and going on to Creature From the Black Lagoon (1954), The Incredible Shrinking Man and others. 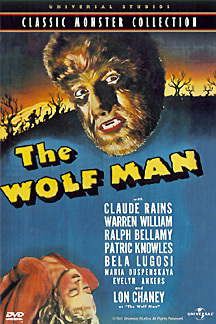 Creature, like Wolf Man, was unique for its era in being the first of a series featuring an enduring monster character. The first essay in this review dealt with the two 1931 Draculas; the second with the three “monster” films of James Whale. The four remaining DVDs in the set are technically equal in quality (except for a few early scenes in The Wolf Man where the picture gets the jitters) and deluxe in presentation. Its more difficult to find thematic commonalities among the four, but there is one strong thread: theyre all about monsters in love. Draculas relationship with women is akin to predator-and-prey. Frankensteins creature merely wants to survive and mate, while The Invisible Man wants the world to grovel at his feet (or at least in the general direction of where the world thinks his invisible feet might be). But the Mummy, Phantom, Black Lagoon Creature and even the Wolf Man, at first, are all out to find that certain someone. Unfortunately their approach to romance is that of the stalker. 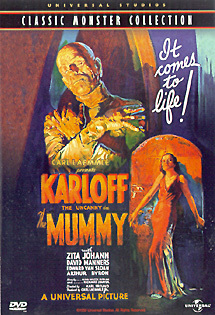 Take for example Karloffs Mummy, the prototypical horror hypnotist. He wants to bring the strange beauty of Zita Johann into his strange world, and he nearly succeeds. Its not the intervention of the ever-ineffectual young David Manners that stops him, or even the formidable old scholar Edward Van Sloan, but Johanns own change of heart. There are horror critics who currently underrate this film. It is too similar to Dracula and it does drag in spots despite director Karl Freunds visual trickery, but the opening scene and the flashback to the Mummys live burial are as creepy as anything from its era, and Karloffs performance cant be faulted. In The Wolf Man, a few scenes before he goes feral, Lon Chaney Jr. is trying out his new telescope and ogles Evelyn Ankers in her bedroom“I was just testing the refractor,” he says later. His ensuing pursuit is insistent and deceptive, and at one point he plants one of the genres least convincing kisses on the actress, a justly uncelebrated cinema moment. The love story evaporates as the title character struggles to understand his transformation. This struggle gives the movie its power, and Curt Siodmaks inventive screenplay manages to exploit the classical aspects of the story without being self-conscious. More firmly in the gothic-romantic vein, The Phantom of the Opera will rise or fall for horror fans on the strength of Claude Rainss part and performance. Hes great, and his Phantom, loaded up with a backstory of failure and obsession, is far more complex than its silent predecessor. Thus he is not really a monster but a mentally ill fellow with burns on his face. Despite the efforts to flesh out the title character, and the lovely use of Technicolor, the movie is less focused and less fun than the Lon Chaney Sr. version. The hitch is not Susanna Foster with her show-off high notes, but Nelson Eddy. Eddy, recently detached from his teaming with Jeannette MacDonald, is dashing enough for the moderate heroics required, but hes also expected to carry some of the comic relief, for which he is completely unequipped. 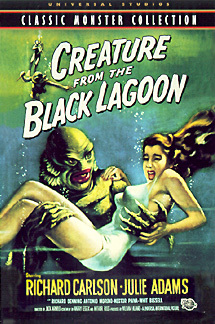 “We didnt make very good films in the 50s, but we had a lot of fun,” said Julie Adams, star of Creature From the Black Lagoon, an exception to her criticism. Watching the film one can see why the Creature is attracted to Adams, who looks pleasant and composed even when shes supposedly worried about a monster attack, as opposed to co-star Richard Carlson, who looks worried even in his love scenes. This is sort of an aquatic remake of King Kong. Most of the movies action is limited to an area hardly larger than a pond, but one tends to forget that, as the well-designed Creature makes repeated attempts to kidnap Adams and is repelled and hunted in various creative ways. How do you generate suspense in a location little larger than a pond, and create mixed fear and sympathy for an actor in a rubber fish suit? In part by shifting point of view, a lesson not lost on Steven Spielberg, who borrowed liberally from Creature when making his hit Jaws. A masterpiece not only of the genre, but for all time? The above phrase is used repeatedly in the packaging blurbs on Universals monster DVDs. In my opinion, eight of the films have earned these superlatives: the two Draculas (issued on one disk), Frankenstein, Bride of Frankenstein, The Invisible Man, The Mummy, The Wolf Man and Creature From the Black Lagoon. 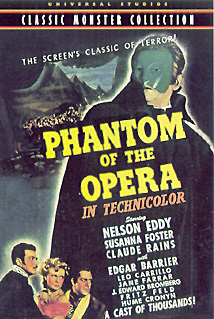 The 1941 Phantom of the Opera is an also-ran, a strong melodrama with one fine performance. I can think of only a handful of classic era horror films that are still as interesting and influential as the great eight: certainly King Kong and Cat People, probably I Walked With a Zombie and Freaks, possibly Mad Love and The Island of Lost Souls, and a few others. I admire these Universal films, but Ive been critical at times of some lapses in the DVD presentation. I dont think any of these faults should dissuade the horror fan from viewing and, if possible, owning these disks for study. They are true classics.